This week, most NHL teams hit the 67 game mark. This means that each team has roughly 15 games left to play before the playoffs start. Yes, it’s that unbelievably close. This means that it’s getting to the point where every game is important. Teams on the bubble can’t afford any large losing streaks, teams at the top need to work out the kinks and teams at the bottom, well they need to tank hard to win big in the draft. Read on to see what transpired in the last week. Calgary Flames – The Flames are in the midst of a 9 game winning streak. It is the longest winning streak that the team has had since moving from Atlanta – not the Thrashers, the first Atlanta team, in 1978. If the team wins on Monday night, it will be the longest streak in franchise history. Given that they currently sit only 2 points behind the Ducks for 2nd place in the Pacific division, this was a much needed boost for the Flames. 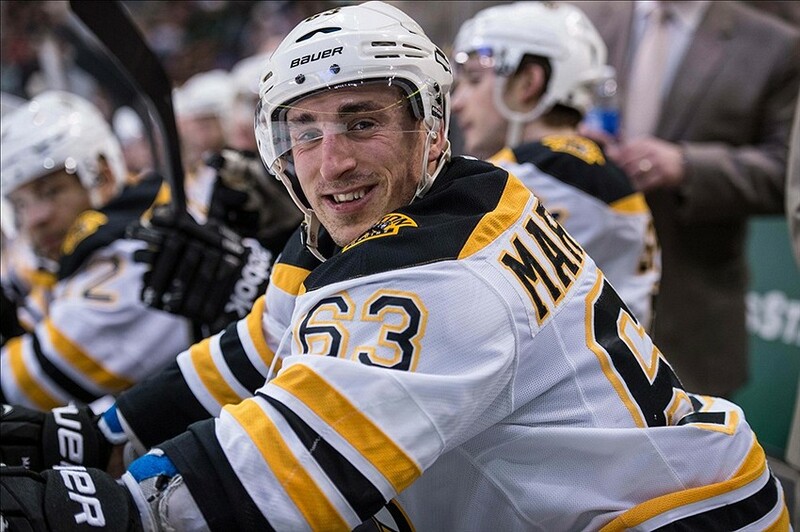 Brad Marchand, Boston Bruins – To say that Marchand is having a great season is an understatement. Last week he became the first Bruin to hit the 70 point mark since Marc Savard did it about 9 years ago. He currently sits 5th overall in points in the NHL and he is 4th in scoring – only 2 points off of the lead. Whispers are starting that Marchand may be a candidate for the Hart trophy this year, and if that happens it would be well deserved. Ryan Getzlaf, Anaheim Ducks – Getzlaf is on a bit of a hot streak lately. He has 2 goals and 8 assists in his last 6 games. He has also amassed 21 penalty minutes, which may sound like an odd thing to praise, but it’s great for some fantasy hockey leagues. Unfortunately for Getzlaf is the fact that Anaheim’s number one goalie, John Gibson has been on and off the injured reserved for the last few weeks. They are hanging in there so far, but that’s going to hurt if the injury ends up being long term. Alexander Ovechkin, Washington Capitals – It feels very strange to put Ovi on the losing list, but he’s not been having an easy time. He is currently on a career-high 10 game goal drought. Added to that is the fact that the Capitals have lost their last 4 games in a row, and are only one point ahead of Pittsburgh for first in the Metropolitan Division. This isn’t all bad news though, even if the Capitals fail to win the President’s Trophy, they’ll still make the playoffs and the trophy can be a little bit of a ‘curse’. Since 2000, only 4 teams that have won the President’s Trophy have gone on to win a Stanley Cup. Winning it is definitely not a guarantee of success. New Jersey Devils – It is not a stretch to say that the Devils are a mess this season. They are currently 0-8-2 and have lost their last 10 games in a row. The Devils sit dead last in the Eastern Conference (just slightly behind the also struggling Red Wings). There’s not much more that can be said about this, only that the team is probably going to have to make some big off season moves, or hope for a good draft, in order to improve for next year. New York Rangers – The Rangers suffered a major blow this week when it was announced that their number one goaltender, Henrik Lundqvist is out for 2-3 weeks with a muscle strain. The good news is that backup goalie Antti Raanta has a solid record and the team has a wide-margin lead in the wildcard race. Still, an injury to a star goalie is never a good thing, especially this late in the season. The Las Vegas Golden Knights signed their first prospect last week. 21 year old Duke Reid from the Brandon Wheat Kings is officially the first player on board. While he is not a player that anyone would know offhand, it’s going to be interesting to see what happens, moving forward, with the Golden Knights. Current NHL teams have until the middle of June to announce which players will be on their ‘protected list’ and are therefore unavailable for the Golden Knights to contact about potential contracts. However, any player not on the list is fair game. Once this time period passes, the team will start to be built. Sure, it’ll mostly be third and fourth line players, but nonetheless I’m sure they’ll acquire a few surprises.